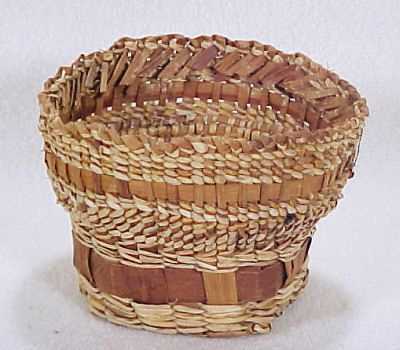 Larger hand-made Makah Indian Basket woven of the inner bark of the Western Red Cedar and beach grass, both gathered and prepared in the Seattle area by Phyllis Pearson. The Makah Indian tribe is noted for it's basketweaving traditions. Phyllis used a variety of basketweaving techniques to complete this woven basket, from plaiting, twining and ti-twining. A signed basketry card from the Basket Co-Op is included, with Phyllis's signature, basketweaving materials used and what basket weaving techniques were used to craft this basket. In the 1860's, the Makah people at Neah Bay developed a cottage industry producing trinket baskets. Through the 1930s, they wove thousands of small colorful baskets for sale. Eventually, plaited bases and rims and commercially available raffia replaced the more labor-intensive fully twined bases and twisted cedar bark. You can read more about various Native American Indian baskets here. For additional information on the Makah Nootka Indian Tribe, please see the Official Website of the Makah Indian Nation. This handmade Makah Indian basket measures 4¼ diameter at the top and is 3¼ tall. The Makah basket has no stains or odors, and ready to display with your finest Native American Indian tribal basketry collection!